This machine is ideal for operating with an operator that pushes the thread into the cutter. The 2 enclosed oil baths make contamination from the machine to the material and from the material to the machine to a minimum. Single-needle, Two-thread double locked chainstitch machine for Plain Closing Only, equipped with mechanically operated continuously running thread cutter. Newlong Industrial DS-9A fixed on a Pedestal. A mechanical thread pusher 305301A is optional available. 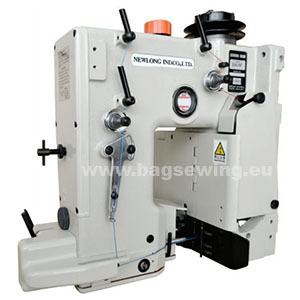 After the bag has left the machine, it wil be push the thread into the mechanical operated thread cutter. Ideal if the machine is continuesly running. This way the operator does not have to deal with cutting the thread.